Amberesque B&B | Welcome to the very first Amberesque B&B blog!! Welcome to the very first Amberesque B&B blog!! We have almost completed the first month since kick-starting Amberesque B&B and coming on to 3 months as residents of Rutherglen! So, what’s the first few months been like? The day that I arrived in Rutherglen to exchange keys with the previous owners, Doug & Jenni, was an emotional event for all involved. Doug & Jenni bid the bank a teary farewell, which was a heartfelt gesture. Whilst waiting an hour for Shannon to arrive in Rutherglen, I wandered around our amazing new home in awe and utter disbelief that we had actually just purchased this gorgeous old bank! We had heard that new butchers had recently taken over 3 doors down from our new home. We decided to introduce ourselves and purchase some of their delicious goodies for breaky the following day. They gave us a sample of their smoked chicken, chilli and cheese cabana… we were in love – best cabana ever!! It’s so good I have to limit our cabana allowance to just 1 stick a week. We decided to celebrate our arrival with a degustation at Taste – it was the perfect start to our new life here. Gav and Fi, the owners/chefs remembered us from a previous visit and made us feel very welcome. 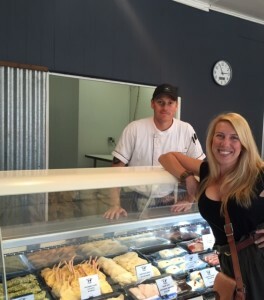 Rutherglen has a population of 1500 and we have very quickly learnt that you run into everyone everywhere! As we left the restaurant we bumped into the butchers that we met earlier on and before we knew it, we were knocking off a couple of nightcaps with them at the wine bar like we were old mates! Settling into the bank has had its moments: discovering how to operate the water spring, numerous pump systems and extensive tank system has resulted in a partially underwater wine cellar. To add insult to injury we also have a water pump that continually conks out, a burst sprinkler system and an enormous garden that’s dying anyway in the daily 38 degree heat! 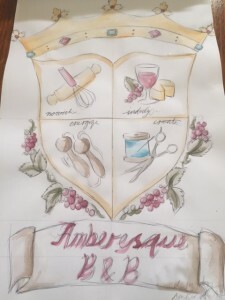 We kicked off the first month of Amberesque international menu with a Scottish theme. Our friendly butchers ordered in a pluck (the offal) to make the haggis and then it was on! 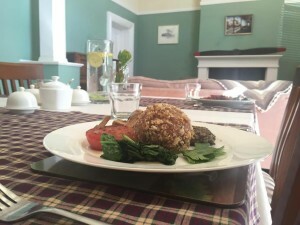 Homemade haggis, scotch eggs and scotch porridge were added to the menu! I was expecting that there would be a lot of haggis leftover at the end of the month – but I was wrong! Most guests have sampled the Scottish staple and have surprisingly enjoyed it too! The Scotch eggs have been a real winner also. Although I have hosted guests on boats, planes and hotels my entire working life… the B&B is uncharted territory for me. I have been blessed so far with the most delightful of guests – so much so, it’s sad when they have to depart. I can only hope this dream run continues. Whilst the Scottish menu is coming to an end, it is time to start designing the next international smorgasbord. During our recent UK jaunt we enjoyed a brief interlude in lovely Paris as Shannon needed to reset his visa… naturally this means French is the obvious choice for our next theme. 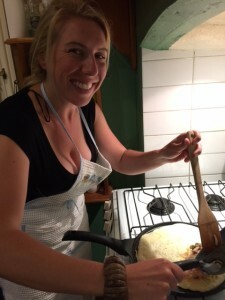 I was originally inspired by Julie and Julia to complete my Scottish cookbook challenge. In a rather full-circle turn of events I have now become intrigued to cook from the Julia Child’s book itself. As I cook through the book, I find myself constantly taking shortcuts and cutting out or replacing butter and cream! How do the French women not get fat?! They certainly mustn’t cook from Julia Child’s cookbook that’s for sure! My main aim is to master the art of the crepe. I have even invested in a batter spreader rake from our Paris trip (after smashing the front display of the shop to get it no less) and a crepe pan from the middle aisle of Aldi. If I become proficient enough they will feature as one of the breaky menu items for April, along with stuffed French toast and Croque-Madame! Looks great Amber. Can’t wait to visit! Can’t wait to have you and the family stay! Very inspiring. Looking forward to our next visit! Winery walkabout will be here before we know it! We will see you both then! So proud of you, Amber. Your B&B looks amazing. Thanks Lara! I really hope you and the family can find a spare weekend to come down and visit us!